Some will say Osama bin Laden at the bottom of the ocean is now appropriately closer to hell; others will say he will simply ascend farther to heaven. Some will wonder what his gunshot wounds look like; others will wonder if the sailors chummed the water before sliding his body into it. United we survivors stand over his body, but we need not gloat. We should be dignified—not for his death, but for our life. We need not provide those visual proofs that would serve as anti-American propaganda and disserve “us”—the U.S. and those who would rather spend billions on helping people instead of on thwarting terrorist. Let us have faith that we discriminately terminated the one who through false interpretation of a genuine faith so indiscriminately murdered Americans and others. Maybe someday, like October 24th, United Nations Day, we can release “doctored” photos, i.e., real photos but with gauze-pad graphics pasted over the gruesome head wound. For now, let us keep to ourselves the last mortal views of him as the rightful antidote to the horrific public views of death on 911. Some say they would have personally pulled the trigger to kill Osama bin Laden, but would they have all really done so when the situation was not theoretical but real, requiring an instantaneous decision? Once, a government officer asked me if, under certain hypothetical circumstances, I would kill a person upon a superior’s order. My impulse was to say yes, but I wonder. As with most hypotheticals, the most common correct answer is “it depends.” With bin Laden, I hesitate because of the “human being” part of the apt phrase “evil human being.” However, in theory, at least, I would pull the trigger to end the life of someone who not only admitted the mass murder but also had never expressed remorse and continued to manifest intent to do it again. Bin Laden sealed his own fate, in the end. The Abbottabad takedown was not an arrest by local police implying constitutional rights, so it did not violate U.S. law per se. It was a military operation. Did it violate international law? Well, it depends. Even in domestic law circumstances can permit justified homicide, e.g., self-defense by the victim, capital punishment by the state, both of which are analogous here. Seal Team Six members were properly committed to killing this terrorist under circumstances that before and during the action allowed no room for error or benefit of the doubt. Guns, not a white flag, greeted the Seals. Ultimately, the onus was on bin Laden to quit being a combatant quickly and clearly. He did not do so, so the killing was apparently legal. 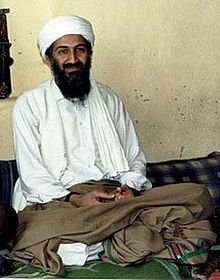 Bin Laden is no chum to humanity; rather, he sank laden with sin. Obama is no chimp, Marilyn Davenport; rather he is one of a number of heroic champs. And yes, Robert Dinero, Trump with all his dinero acted like a chump recently. Now let’s get back to the business of being good Americans.